While climate negotiators meet behind closed doors to implement the Paris Agreement, climate activists have put out their own set of demands. 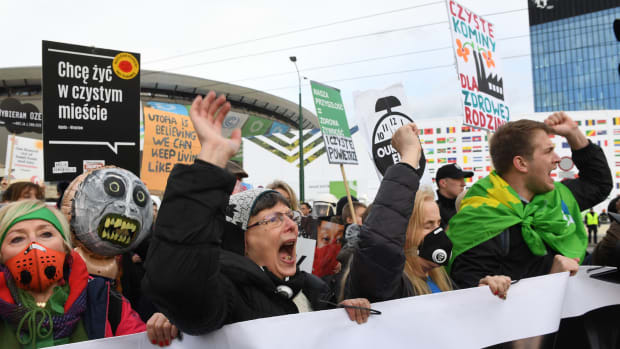 "We&apos;ve been negotiating in these halls for over 24 years," Phillip Brown, a COP24 delegate for SustainUS, told the crowd in Katowice, Poland, "and global leaders continue to fail us." On Monday, as delegates entered the maze of the COP24 conference center in Katowice, Poland, they were greeted by the upbeat sound of a Polish marching band. On Tuesday it was a chorus: the voices of dozens of young climate activists from all over the world. "We demand so much more from COP24," the group sang in unison. "We remember, we resist, we rise." 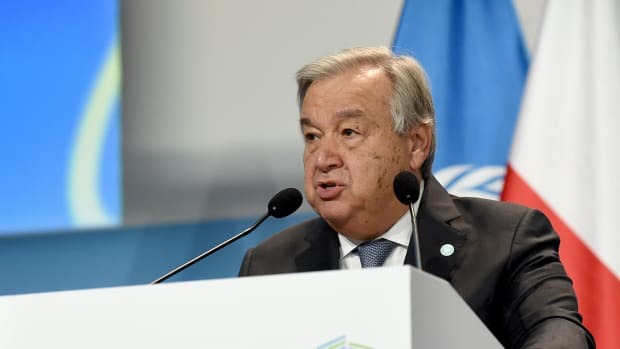 Long frustrated by the slow pace of climate action and what they view as the tendency among the United Nations&apos; members to cave to industry interests, the gathered activists found little to be optimistic about in the opening ceremonies of the summit this year, where world leaders spoke repeatedly about the complexity of the negotiations and the need for compromise. 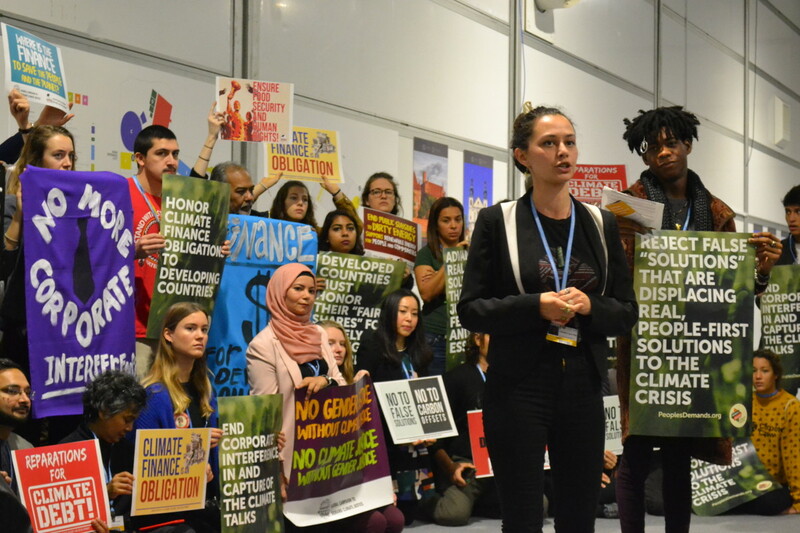 These activists are no longer interested in compromise, and, on Tuesday, they delivered the People&apos;s Demands for Climate Justice, an official list of climate action demands that organizers say are endorsed by 330 organizations and hundreds of millions of people from 129 countries. 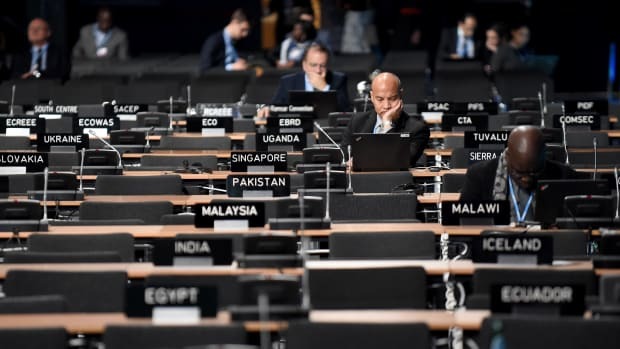 Still, these fundamental concerns too often go overlooked in the negotiations at events like COP24. 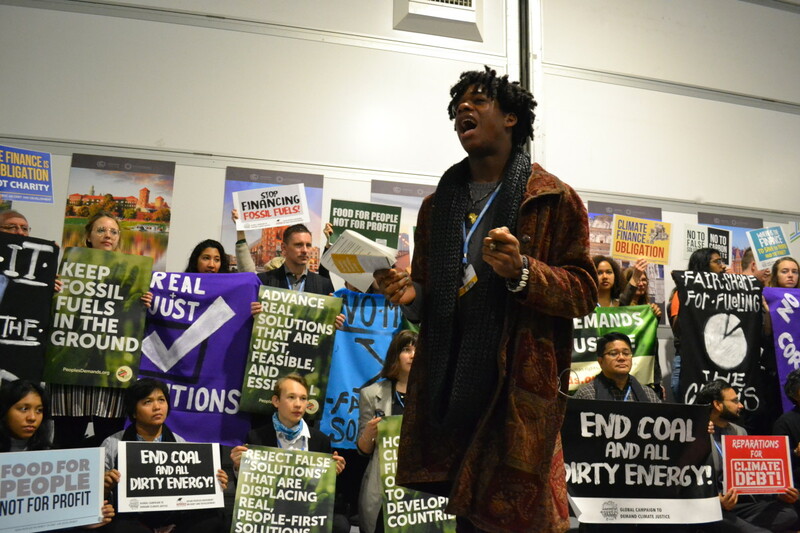 Phillip Brown, a COP24 delegate for the youth-led non-profit SustainUS, set the tone for the action event: "We&apos;ve been negotiating in these halls for over 24 years," he told the crowd, "and global leaders continue to fail us." One by one, Brown introduced a list of speakers from around the globe—one for each of the People&apos;s Demands. "Every year, as we add greenhouse gas emissions, the people are suffering," Ian Rivera, of the Philippine Movement for Climate Justice, told the crowd, recalling the series of powerful typhoons that have ripped across the Philippines in recent years, causing untold deaths and billions of dollars in damage. Rivera led the crowd in chants of "keep fossil fuels in the ground." The People&apos;s Demands call on countries to commit to 100 percent renewable energy by 2030—an ambitious timeline, but, as Dipti Bhatnagar, of Friends of the Earth International, told reporters after the action event, "the climate science tells us that even this is too late." The group also wants governments to end all subsidies to the fossil fuel industry—which amount to roughly $373 billion every year, or nearly three times what the world&apos;s richest countries have pledged to give vulnerable nations as part of the Green Climate Fund—by 2020. "The fact that our governments are still subsidizing fossil fuels is an absolute disgrace," she said. "In my community, we know how to live within the boundaries of our landscape," India Logan-Riley, from Te Ara Whatu, an indigenous youth climate group from Aotearoa (or New Zealand, in Māori), told the crowd. Indigenous communities are indeed the most effective stewards of the Earth; more than 80 percent of the world&apos;s remaining biodiversity is on indigenous lands. The forest areas where indigenous communities have a legal right to the land—and it&apos;s worth noting here that the vast majority of indigenous lands are not formally recognized by governments—hold some 37.7 billion metric tons of carbon. That&apos;s almost 30 times the amount emitted by all the world&apos;s passenger vehicles every year, so it&apos;s critical for everyone that the people most equipped to care for these carbon sinks have a say in how they are managed. The People&apos;s Demands includes a call for solutions to climate change that center on communities and people, rather than "techno-fixes," like carbon capture or offsetting schemes, that undercut emissions-reduction targets and threaten indigenous land rights. "Climate crisis is not an investment opportunity," Souparna Lahiri of Global Forest Coalition said after the event. "In my community, we know how to live within the boundaries of our landscape," said India Logan-Riley from Te Ara Whatu, an indigenous youth climate group from New Zealand. Friends of the Earth&apos;s Mariana Porras, who hails from Costa Rica, argued that Costa Ricans on the ground already have community forest management programs that are more sustainable and effective than many of the forest initiatives that have come from international negotiations and organizations. Porras and others pointed to REDD+, the U.N. Program on Reducing Emissions from Deforestation and Forest Degradation, which aims to reduce carbon emissions by reducing deforestation rates. But among many indigenous groups and environmental groups, the program is regarded as just another way that corporations and rich countries can exploit indigenous resources without consulting the communities living there. 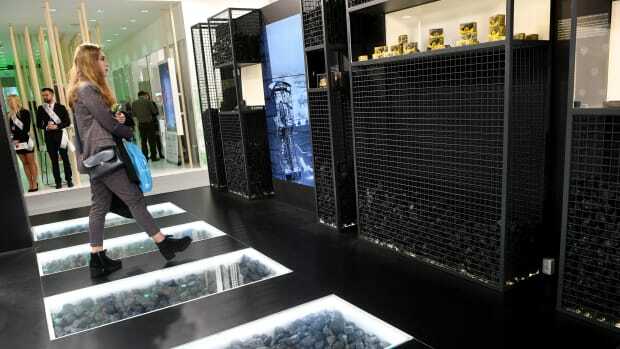 Porras called REDD+ "a scheme to commodify nature." "Communities on the ground are already impacted by dirty energy in so many different places. The impacts are literally coming into people&apos;s homes," said Bhatnagar of Friends of the Earth International, "and now people are also being impacted by false solutions, by their land being taken away for carbon sinks." "Those who have less responsibility are paying the most for the impacts of climate change," Wanum Permpibul, of Climate Watch Thailand, told the crowd, noting that, without funding from the world&apos;s richest nations (whose historical emissions have left Thailand&apos;s coastlines and food systems vulnerable to climate change), developing nations won&apos;t be able to adapt. "Climate finance is not aid," Harjeet Singh of ActionAid said Tuesday, "it&apos;s an obligation." Developing countries, already facing a deficit for development, are now having to divert funds to adapt to climate change and recover from increasingly fierce climate disasters. And while developed countries have committed to provide climate finance to the Green Climate Fund, many wealthy nations have yet to meet that target, or even agree on what counts as climate finance. 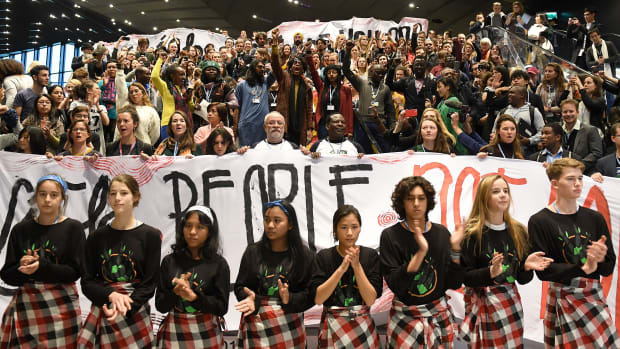 What&apos;s worse, as negotiators kick the climate finance can down the road, the costs grow each year, so the People&apos;s Demands includes a call for countries not just to meet their current finance pledges, but to raise their commitments by 2025. "Rich countries need to commit to climate reparations to those most affected, but least responsible for, climate change," Singh told reporters. "We just talked about what [the impacts of climate change] are costing people around the world right now, but while it&apos;s costing many of us here and around the world, some people are getting rich," said Sriram Madhusoodanan, deputy campaigns director at Corporate Accountability, a non-profit. "Some corporations have been getting massively wealthy for far too long. And guess what? They&apos;re in these talks." Madhusoodanan called out extractive industries for "blocking real solutions and advancing false solutions that will continue to propagate their business model," all while benefiting from the green veneer that participating in the climate summit can offer to industry. Nathalie Rengifo, also of Corporate Accountability, told reporters after the action that corporate participation in the COPs is the elephant in the room every year. "Just yesterday, Exxon announced that they have found a new oil reserve on the coast of Guyana," she said, "and here we have them walking in these spaces." "This conference has been happening for longer than my entire life," Aneesa Khan, of SustainUS, told the crowd. Just a week before the Paris Agreement was created, she recalled, her home on the southeast coast of India was flooded; hundreds of people were killed and thousands more displaced. "I didn&apos;t hear from my family for three days. I had no idea if they survived. No one deserves this kind of suffering," she said. "Developed countries of the world, I&apos;m here to remind you, in case you forgot, that you are historically responsible for this climate crisis." The idea of "common but differentiated responsibilities" has been a part of the U.N. Framework Convention on Climate Change from its very inception, which means that, as far back as 1992, countries agreed that some countries were more responsible for climate change than others, and thus had a greater responsibility to deal with it. 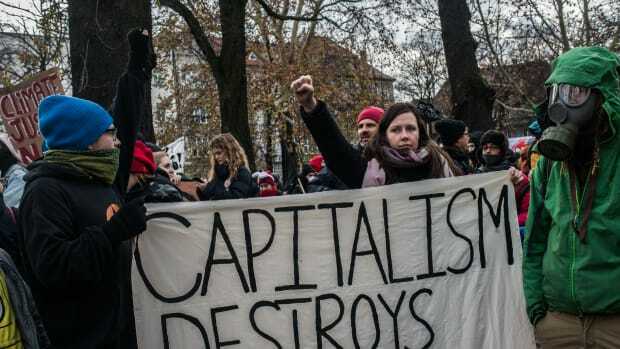 But since then, according to Lidy Nacpil, of the Asian People’s Movement on Debt and Development, governments and corporations alike in the world&apos;s richest nations have worked relentlessly to water down this UNFCCC principle. "What we are asking today is no more or less than an honoring of the commitment they made by signing up to this convention," Nacpil said Tuesday, "and that is to do their fair share." Khan reminded listeners that it is usually women, indigenous groups, minorities, and low-income populations that bear the brunt of climate change, and that these people are already doing their part to stop the crisis. "From environment defenders in Latin America to the Standing Rock Sioux in the U.S. to the anti-coal activists in the Philippines and right here in Poland, we&apos;re here, we&apos;re rising, we&apos;re resisting, we&apos;re fighting," Khan said in her address to developed nations, "but where are you?"